Set in a 2-hectare park in the Verdon Regional Nature Park, Hôtel Restaurant L'Ermitage features an outdoor swimming pool, 3 terraces, a bar, a restaurant and panoramic views of the mountain. The rooms at Hôtel Restaurant L'Ermitage feature a balcony, en suite facilities with bath, free toiletries and a hairdryer, and a flat-screen TV. They also offer views of the pool. The restaurant serves local and traditional cuisine, and the bar offers a wide range of cocktails all year long. 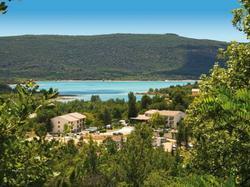 Hôtel Restaurant L'Ermitage is 5 km from the Verdon Gorge and the Lake of Sainte Croix is 800 metres away. Nearby outdoor activities include hiking, swimming in the Lake, paragliding and canyoning. If you plan on arriving after 18:30, please notify the property in advance. Contact details can be found on the booking confirmation. Spa access is not included in the price. Please note that the restaurant is closed in January 2015. The rooms are individually decorated and feature a balcony or a terrace with views, a flat-screen TV and individual heating. The private bathrooms include free toiletries, a hairdryer, and bath or shower.